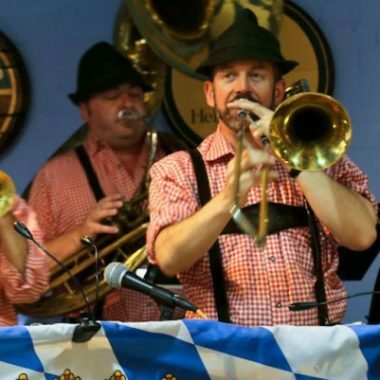 The Edelweiss Bavarian Showband are perfect for functions, parties, wedding receptions, corporate events and of course beer festivals, bierkeller & Oktoberfest! 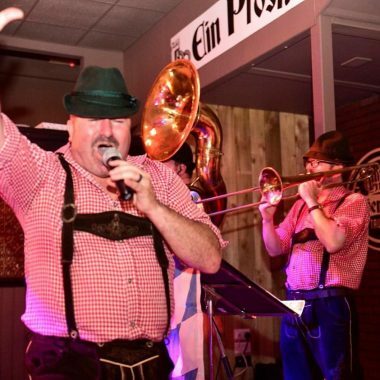 The Edelweiss Bavarian Showband will tailor their performance to entertain your guests with party games and fantastic Bavarian Oompah music. They are the Oompah Band to the stars! Having performed for Ant & Dec, Stephen Mulhern, Dermot O’Leary, Keith Lemon, Vernon Kay, plus many more! The five-piece band consists of clarinet / front man, trumpet, trombone, bass and percussion. Their show includes games, audience participation, sing-a-long, and lots of dancing. They get everyone swaying from side to side in time to the music, just like in traditional Bavarian halls. They perform two x 45 minute sets of non-stop music, fun and games. The 2nd set is the “party set” to get everyone up dancing. This set includes more audience participation, as well as dancing classics such as Hey Baby, Rock Around The Clock, Delilah, Sweet Caroline, Daydream Believer, YMCA, The Can Can, Hey Baby, Amarillo, Don’t Stop Me Now, & Wipeout. The final number is always New York New York which brings the evening to a rousing finale.